You are never too old to get your face painted! If you have ever seen the iconic Disney movie Tangled,(which, unless you live under a rock, you have), you will recognize the name Pascal. Pascal was Rapunzel’s pet chameleon and was by far one of the cutest things I have ever seen. Ever since watching that movie, any mention of a chameleon, which of course comes up in every day conversation quite a lot, I cannot help but think of little Pascal and his everchanging color. Just this past Saturday, I participated in the Best Buddies Friendship Walk, an event in downtown Tampa. Just before leaving, my friend Madi (another Pascal fan) and I spotted a girl walking by with a little chameleon painted on her face. 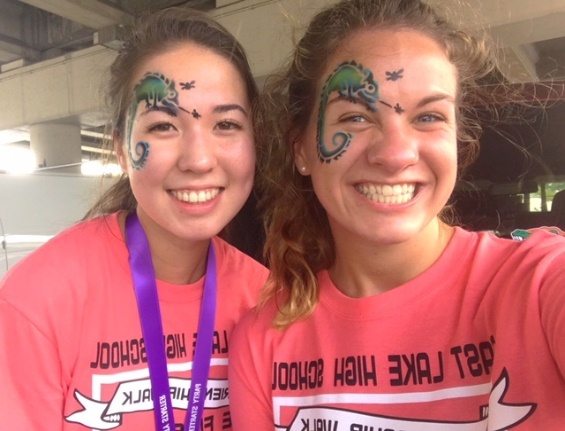 We weren’t planning on getting our faces painted, but after seeing what was available, we had to check it out. Low and behold, a Pascal look-alike was one of the options for face-painting and rest assured, we waited in line for a good twenty minutes for it. This recent experience with the chameleon sparked my interest in them and so, brace yourself for a detailed description of the chameleon. Being a reptile that is part of the iguana suborder, chameleons are mostly known for their unique feature of being one of the very few animals that can change their skin color. However, it is actually not true that they match their skin color to their surroundings. The main reason behind the color change is relevant to the communication between chameleons. When their skin color changes, it is due to either a change in their emotions, like anger to fear, a change in temperature, or a change in humidity. How they change their skin color relates to the iridophore cells in each adjacent layer of their skin. They excite or relax the skin cells of the upper layer, resulting in a color change. I must say, that is pretty cool. Looking at the chameleon population as a whole, there are over 171 species of chameleon. The largest one is the Parson’s Chameleon, which can grow up to 27 inches! Can you imagine seeing a 2-foot long lizard running around? The Leaf Chameleon is the smallest among the species and is actually one of the smallest vertebrates ever discovered. It grows to a mere 0.5 inches, sitting comfortably on the head of a match! If you go outside and look for one of these little guys, you probably won’t find one. They typically live in Madagascar, Africa, Spain, Portugal, and Asia. However, the Veiled Chameleon is one that you can find in local pet stores. The rain forest is the common habitat and trees/bushes are typically where the chameleons call home. Just in case chameleon curiosity ever gets the best of you, that is basically all that you need to know. And, if you haven’t watched Tangled… now would be the time.